Best known as Mr. Sulu, helmsman of the Starship Enterprise™ and captain of the Starship Excelsior, George Takei is beloved by millions as part of the command team that has taken audiences to new vistas of adventure in Star Trek®—the unprecedented television and feature film phenomenon. From the program’s birth in the changing world of the 1960s and death at the hands of the network to its rebirth in the hearts and minds of loyal fans, the Star Trek story has blazed its own path into our recent cultural history, leading to a series of blockbuster feature films and three new versions of Star Trek for television. The Star Trek story is one of boundless hope and crushing disappointment, wrenching rivalries and incredible achievements. It is also the story of how, after nearly thirty years, the cast of characters from a unique but poorly rated television show have come to be known to millions of Americans and people around the world as family. For George Takei, the Star Trek adventure is intertwined with his personal odyssey through adversity in which four-year-old George and his family were forced by the United States government into internment camps during World War II. Star Trek means much more to George Takei than an extraordinary career that has spanned thirty years. For an American whose ideals faced such a severe test, Star Trek represents a shining embodiment of the American Dream—the promise of an optimistic future in which people from all over the world contribute to a common destiny. Best known for playing Sulu on the original Star Trek TV series and six movies that followed, George Takei is unlikely social media royalty. Unofficially dubbed the King of Facebook, he counts 5.5 million fans in his online empire – including Trekkies, Howard Stern listeners, and the LGBTQ community – who devour his quirky mix of kitten jokes, Star Trek references, heartfelt messages, and sci-fi/fantasy memes. His current projects include the musical Allegiance, drawn from his experience of growing up in Japanese American internment camps during World War II, and the recently published Oh Myyy! There Goes the Internet and Lions and Tigers and Bears: The Internet Strikes Back. I saw this listed on NetGalley, and requested the digital ARC, not realizing this was just a re-release of the same autobiograpy Takei published in 1994, which I have in hardcover already. Still, it’s a good read – Mr. Takei’s life is incredibly rich and interesting and he tells his own story so well that anyone familiar with the cadence of his voice, whether from vintage reruns of Star Trek or from his more recent projects will hear the words in their head, and feel as though they are sitting at the knee of a family elder. And really, especially since the loss of Leonard Nimoy, that’s what George Takei has become. If Nimoy was the honorary grandfather of all us fans, then Takei is our honorary uncle, the one who has no filter, who looks for the humor in everything, and who, in spite of everything he’s experienced, or seen others experience, still sees hope and possibility and the best in all of us. That sense of hope and possibility is woven into every line of this autobiography. We see young George bond with a stray dog in the internment camp where he and his family were forced to stay, share his first experience with Mexican food (something that impressed me – having grown up in Colorado and California, I can’t remember a time when I wasn’t reasonably familiar with Mexican food) and culture, feel the nervousness and later the thrill at his first taste of acting, and go through the realization that he’s gay, but even when he’s sharing the darkest parts of his life, there’s still that glimmer of positivity, that ray of hope. If you, as I did, grew up on reruns of the original Star Trek, came of age during the movie era, and were gifted with TNG only after you were mostly-grown up, you will likely enjoy this autobiography in the same fashion you would any family story, even if that family is only one of spirit, and not blood. If you are younger, and know Mr. Takei through his activity on Facebook and Twitter (where, I confess, he is a great favorite of mine, even though I’m rarely brave enough to interact with him), you will enjoy this book because it shares where he came from, and adds context to many of the things he talks about. Either way, To The Stars is an interesting, engaging read, from a man who will probably never run out of stories to tell or silly memes to share. Goes well with A homemade burrito and a glass of chilled horchata. 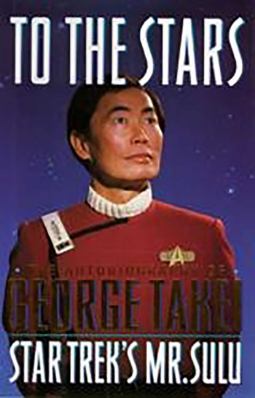 To The Stars, by George Takei (@GeorgeTakei) #review #autobiography @NetGalley by Melissa Bartell is licensed under a Creative Commons Attribution-NonCommercial-ShareAlike 4.0 International License.